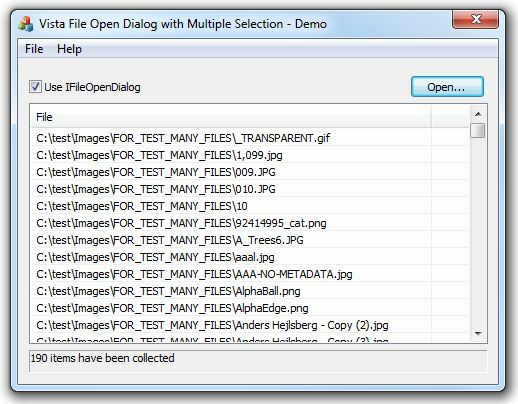 Setting OFN_ALLOWMULTISELECT flag tells to Open File dialog to allow multiple file selection. That works fine as log as the user selects a pretty small number of files. Otherwise, it fails with no warning and no file name (or even worse, some garbage) is retrieved. If the first parameter of constructor is TRUE, CFileDialog uses GetOpenFileName Windows API function that takes an OPENFILENAME structure. 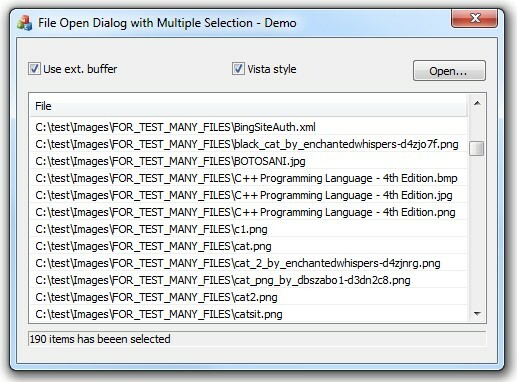 No matter if multiple selection is set, it retrieves all selected (full path and) file names in one single bufffer, which is poited by lpstrFile member of OPENFILENAME. By default, the size of that buffer is set to MAX_PATH (about 260) characters which is pretty small. One solution is to make pstrFile member of OPENFILENAME to point to a large enough buffer, able to keep much more file names. Also, the nMaxFile structure member must be set to actual extended buffer size (in characters). It works but is not very ellegant because uses a fixed buffer. Next, well show a method which dynamically estimates and allocate the necessary buffer. CFileDialog::OnFileNameChange is a virtual function that is called as a response to CDN_SELCHANGE notification, sent when the user changes the selection. We can override that function in our own CFileDialog-derived class, then send CDM_GETFOLDERPATH and CDM_GETSPEC mesages in order to estimate the required buffer size. Pretty nice but it works only if CFileDialog has not Vista style. I’ll show how to resolve this, in the next article. This entry was posted in MFC and tagged CFileDialog, mfc on 2013.05.19 by Ovidiu Cucu.